Following a 2.2% increase in May, retail sales edged down 0.2% in June to $50.7 billion. Sales were down in 6 of 11 subsectors, representing 52% of total retail trade. Lower sales at gasoline stations and motor vehicle and parts dealers more than offset higher sales at food and beverage stores and building material and garden equipment and supplies dealers. Excluding the first two subsectors, retail sales were up 0.3%. After removing the effects of price changes, retail sales decreased 0.3%. On a quarterly basis, retail sales were up 1.0% in the second quarter following a 0.5% decrease in the first quarter. In volume terms, retail sales increased 0.9% in the second quarter. After increasing 5.2% in May, sales at gasoline stations decreased 2.3%, in part due to lower prices at the pump in June. In volume terms, sales at gasoline stations decreased 0.4%. Sales at motor vehicle and parts dealers (-0.7%) were down for the second time in three months. Lower sales at new car dealers (-0.6%) and automotive parts, accessories and tire stores (-3.8%) accounted for the majority of the decline. Higher receipts were reported at food and beverage stores (+0.9%). Gains were reported at all store types within this subsector, led by supermarkets and other grocery stores (+1.2%). Specialty food stores, convenience stores and beer, wine and liquor stores were all up for the fourth consecutive month. Building material and garden equipment and supplies dealers (+1.1%) and health and personal care stores (+0.6%) also reported higher sales in June. Retail sales were down in six provinces in June. British Columbia (-1.8%) reported the largest decrease in dollar terms, with sales down in 10 of 11 subsectors. Following a 1.0% decline in May, lower sales were also reported in the census metropolitan area (CMA) of Vancouver (-2.1%). After increasing for five consecutive months, retail sales declined 1.2% in Alberta. Despite this decline, sales remain above the level in April. In Quebec, retail sales declined 0.7%, largely due to lower sales at new car dealers. Retail sales in the Montréal CMA (-0.3%) were also down. Retail sales in Ontario rose 0.7% on the strength of higher sales at food and beverage stores and, to a lesser extent, motor vehicle and parts dealers. 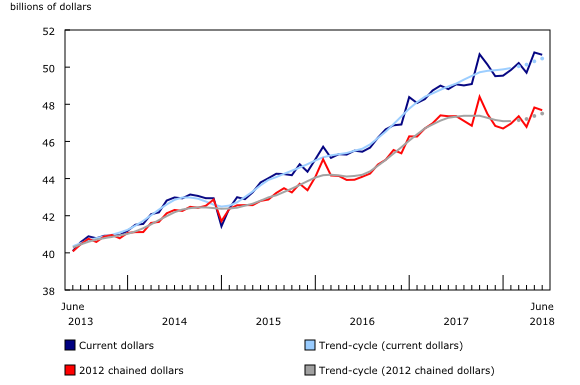 In the Toronto CMA (+2.0%), retail sales rose for the fourth time in five months. Sales continued their upward trend in Manitoba (+1.8%), while retail sales in Saskatchewan rose 1.4%, which more than offset the decline in May. With this release, volume data in table 20-10-0078-01 have been revised back to January 2009 in order to incorporate updated weights based on annual revisions to the retail commodity survey. Real-time tables 20-10-0054-01 and 20-10-0079-01 will be updated on September 10. Data on retail trade for July will be released on September 21. For analytical information, or to enquire about the concepts, methods or data quality of this release, contact Jason Aston (613-951-0746; jason.aston@canada.ca), Retail and Service Industries Division.